Greetings and Salutations! 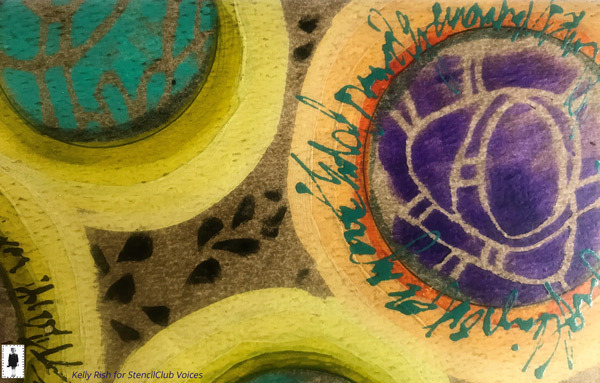 Carol Baxter here and I am pleased to bring you a whole bunch of captivating projects by our StencilClub Voices! This month, Mindy Flannigan, Michelle Pierron, Kelly Rish and yours truly took a mixed media walk Into the Woods! 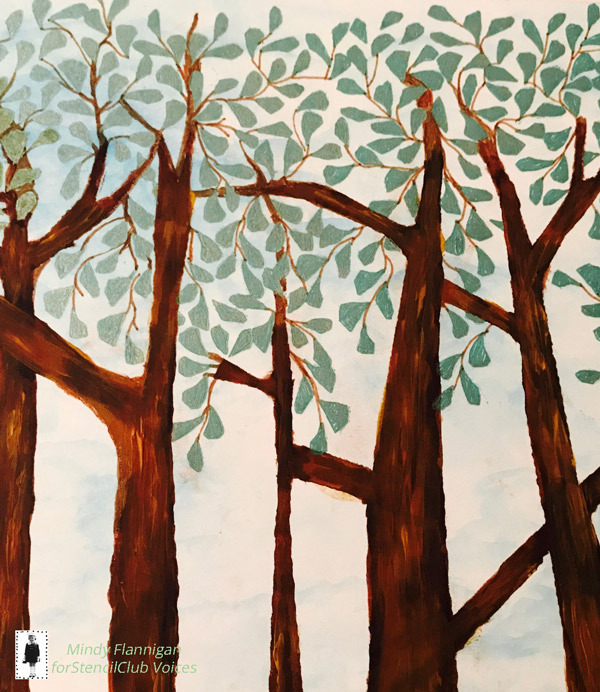 Mindy Flannigan writes, "I've loved drawing trees since I was young. 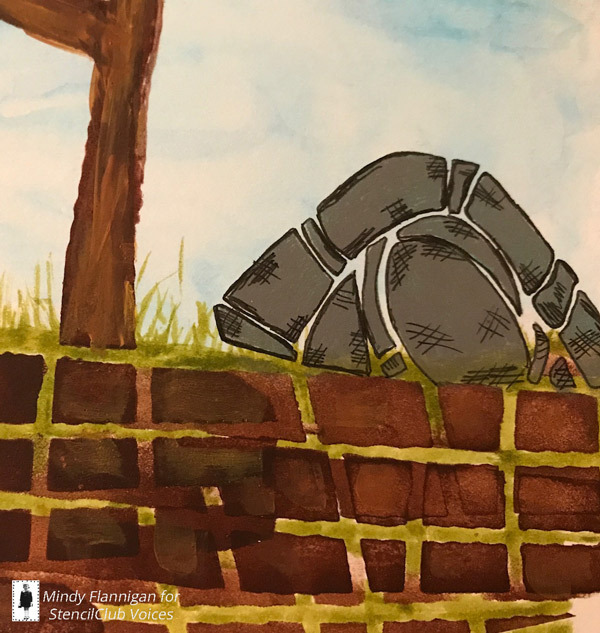 On multi-media paper I used distress inks for background, acrylic paint, gel/watercolor pens and a Micron pen for details on the rocks. I love the grid patterns." Michelle Pierron picked and chose parts of each Into the Woods stencil that spoke to her for these art journal spreads. 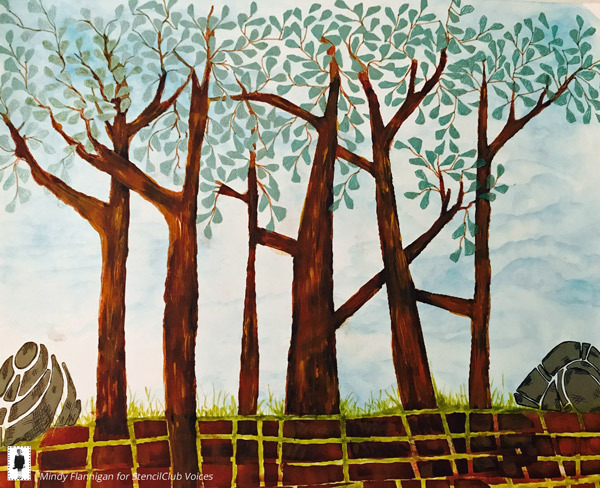 Michelle writes, "I way trying to focus on the fact that I see myself and others in social media say so many negative things about themselves that I know they would never say to someone else. 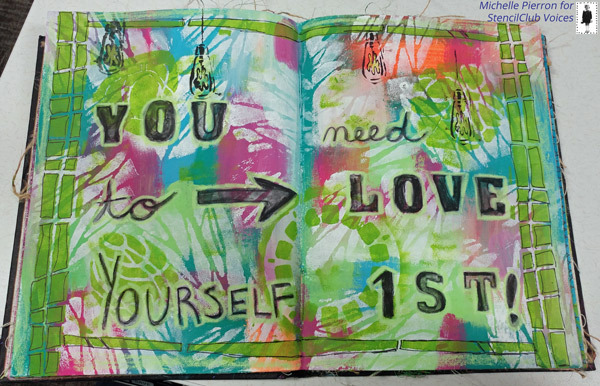 I hate that we find it so easy to bash our bodies, our spirits, our abilities, so I made this page to remind me that I have to love myself first. If I wouldn't say a comment I think about me to another human being regarding them, then its not worth saying to myself!" 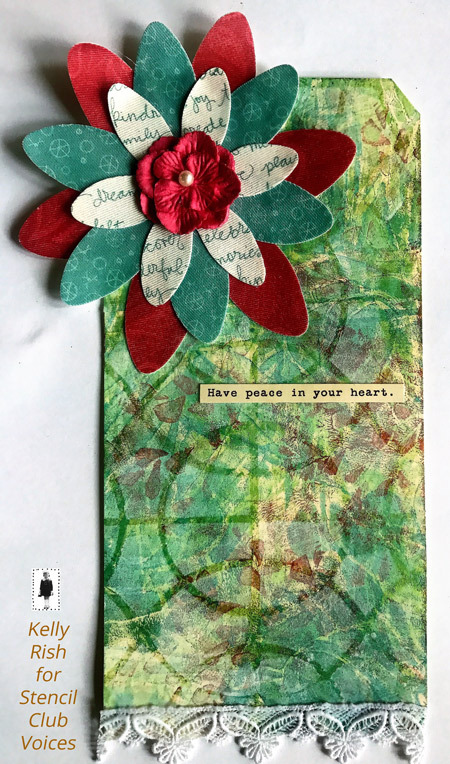 Michelle used her favorite part of the set, the leaves on the small stencil, along with some affirmations she was given to create this art journal page. "I especially loved the look of them against the color of craft paper when I used some yellowish green paint." "It doesn't have to be good; its not going in a museum. It just has to get across a feeling I have." Michelle traced one of the images from the 6x6 stencil and rotated it to make it into a flower shape and put them in a vase cut out from some scrapbook paper. She writes. "Honestly, its not an amazing or hard page, but it makes me smile every time I look at it, and it makes me think about other options I have to use this idea. 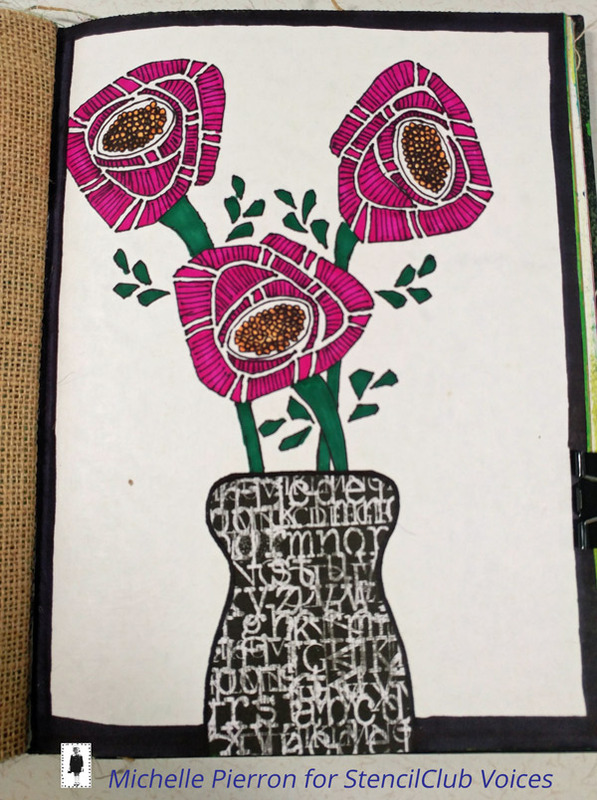 I could easily see it put on an apron or skirt or even on a wooden panel and hung on the wall." Kelly found a magazine page with a saying she liked for the tag. Kelly writes,"We recently lost someone dear to our family. This tag evolved as I began to put a care package together. 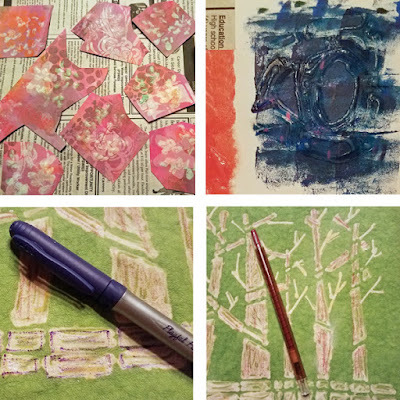 Kelly's tip #1 "I keep turning my paper, letting the brush marks go all ways. I don't think about it, I just play." Kelly's tip #2: "Then. 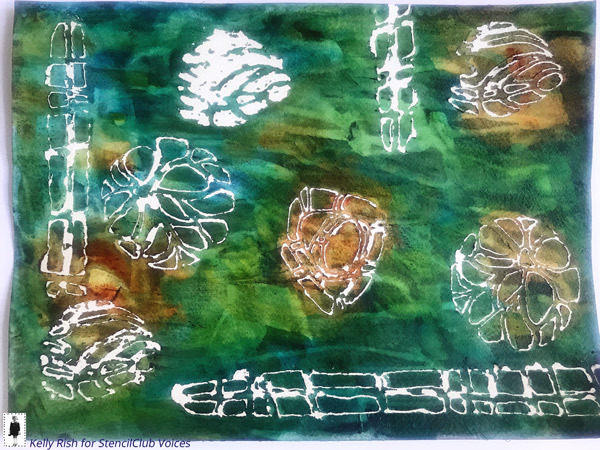 with my nail, I rub off the masking fluid lines,and it's done." 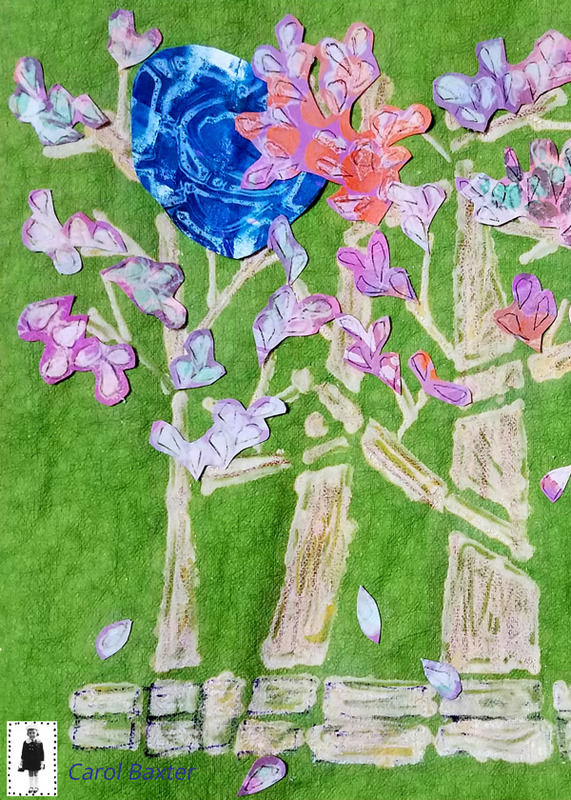 She says, "You can make 1 beautiful piece or, because I wanted to practice with the stencils, I will cut up and use pieces of this paper in other things." Glaze over entire paper with a mixture of half satin glaze and half raw umber, wait a minute or two and rub off excess with baby wipe. 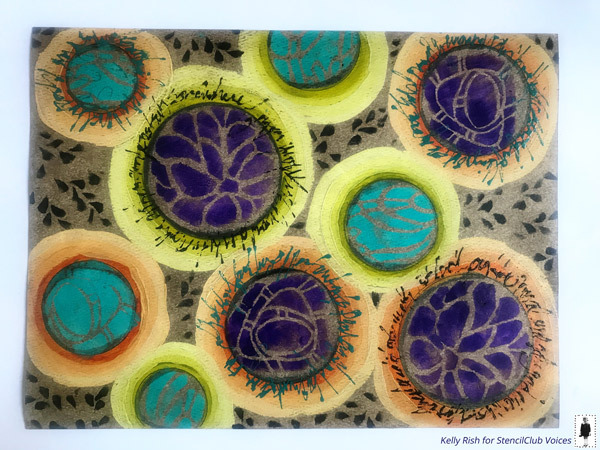 Kelly says: "I have not done that glazing the process on watercolor paper before, but it worked ok. I got that grunge look, verses a stark white background." Carol greeting you again. 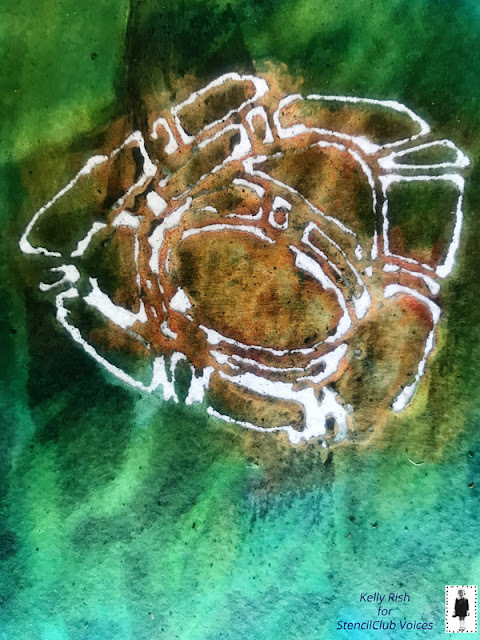 Some months back I was playing with a bleach pen on Kraft Tex Fabric paper and it dyed it yellow in places and white in others so I figured I would give it another try. 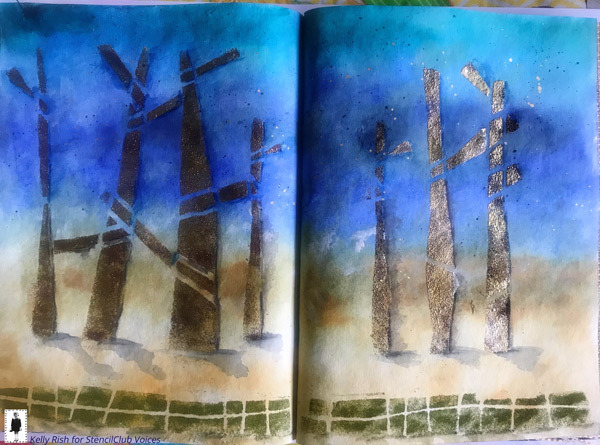 If it had stayed yellow, as it looked while drying, I would have left the trees yellow and added just a few ink marks for the bark. 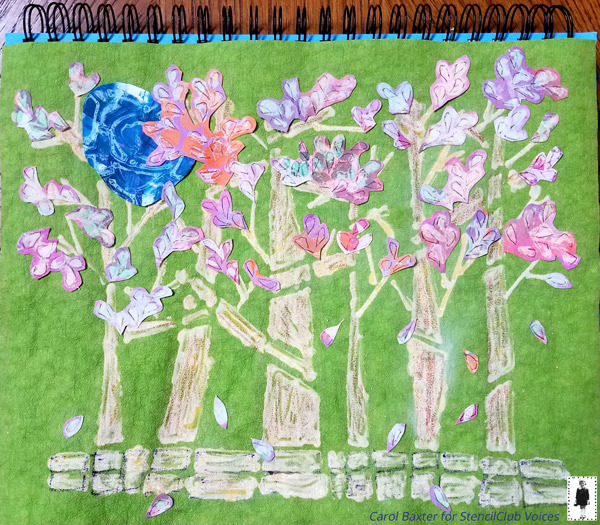 I used a crayon for the the tree bark. 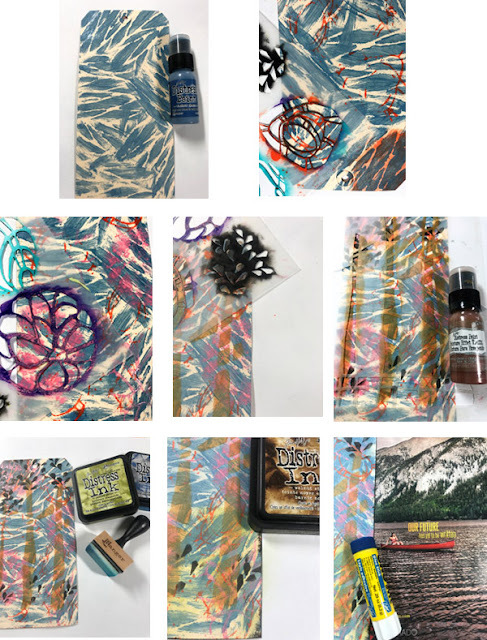 I wanted to see what would happen if I used the bleach pen on a collage sheet and bit of scrap paper (both painted with acrylics) so I dug through my scraps and found ones that were mostly the color of the leaves and nest I wanted and used parts of the small stencil. Not quite before the leaves were dry, I used a regular ink pen to add some definition before I cut the leaves and nest out and glued them down. 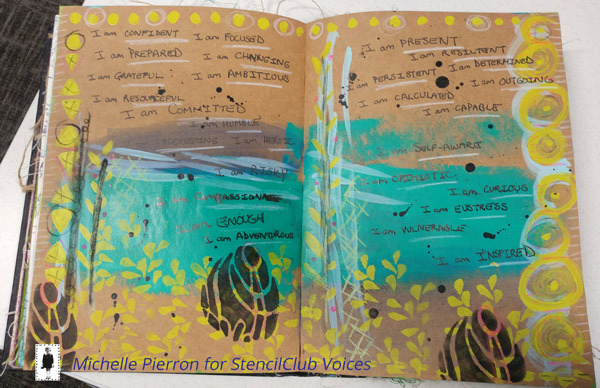 Thanks for checking out what our StencilClub Voices members created! 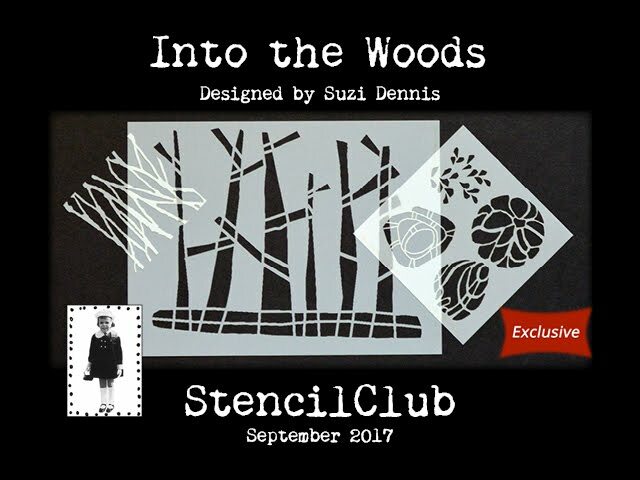 We all hope you are inspired to take to your own "studios" with Into the Woods by Suzi Dennis.